Some, of course, benefit directly, because they either receive in CEO compensation or in the form of stock dividends a portion of the enormous profits created within the fast-food industry. The reason profits are so high is because fast-food wages are very low (an average of $8.69 an hour for those working at least 27 weeks in a year and 10 hours a week), and fast-food employers are able to shift the cost of the low wages they pay their employees to public programs (such as Medicaid, the Children’s Health Insurance Program, Earned Income Tax Credits, food stamps, and Temporary Assistance for Needy Families). 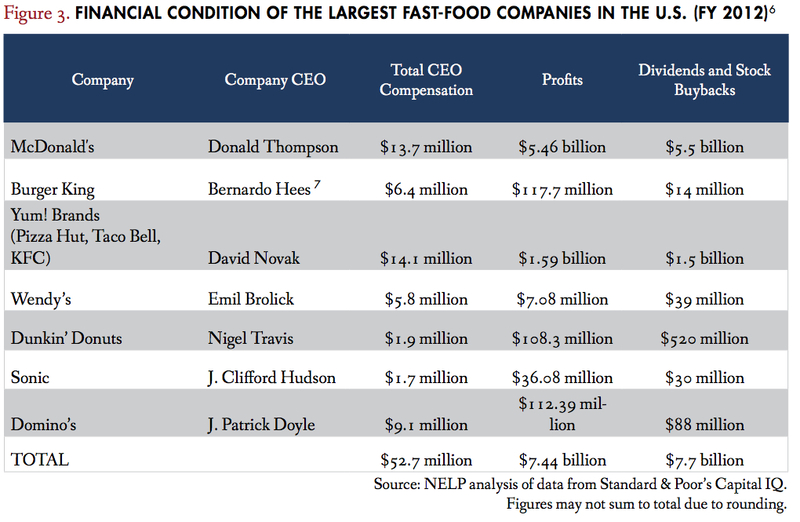 Those at the very top of the nation also benefit from the fast-food industry because, as a result of low wages and public programs to assist the working poor, fast-food prices are kept down. Thus, the price of one of the elements of the wage bundle of all workers—food—is kept low. Thus, workers in all industries—not just fast food but the production of all goods and services—have to spend less of their day working for themselves and more of the day working for their employers. That, in turn, raises profits in those industries, a portion of which shows up in the executive-compensation packages and dividends of the tiny minority of income earners. The prototypical high-net-worth individuals who are “coastal, educated, older, white and male,” certainly don’t consume fast food on a regular basis. ** But they’re the folks who benefit, both directly and indirectly, from the existence of a fast-food nation. 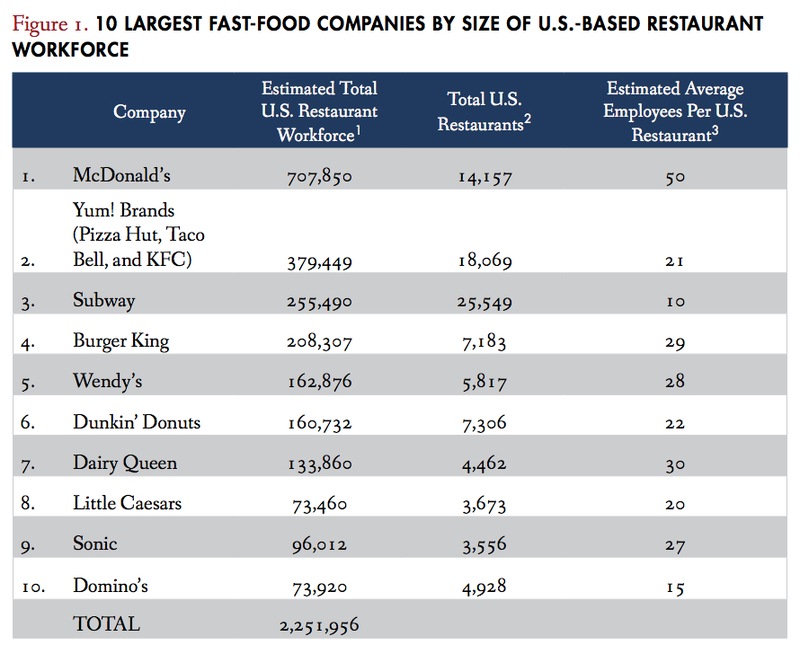 *The information in this post comes from two recent reports: Super-Sizing Public Costs: How Low Wages at Top Fast-Food Chains Leave Taxpayers Footing the Bill [pdf], by the National Employment Law Project, and Fast Food, Poverty Wages: The Public Cost of Low-Wage Jobs in the Fast-Food Industry [pdf], by Sylvia Allegretto et al. at the University of California, Berkeley, Center for Labor Research and Education and the University of Illinois at Urbana-Champaign Department of Urban & Regional Planning. **Although at least one neoclassical economist who opposes any increase in the minimum wage, John Cochrane, occasionally does.